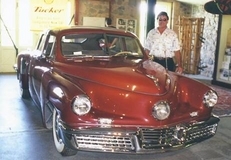 Formerly a commercial banker in Chicago for 13 years, George Eber began promoting and conducting vintage car auctions outside Chicago in 1987 at the Volo Auto Museum. In 1988 George co-founded Muscle Car Mania (a vintage muscle car auction), which was held in Lake Geneva, Wisconsin and the Pheasant Run Resort in St. Charles, Illinois in the late 80’s and early 90’s. After moving to Dallas, Texas in 1992, George conducted sales around the country including Dallas, Atlanta, Chicago, Michigan, Indianapolis, Nashville, Tennessee and Lexington, Kentucky. George founded the Music City Classic auction in Nashville in 1995, where he relocated in 1998 and where he remains today. The Music City Classic has evolved into the mid-south’s premier collector car auction. Besides the semi-annual Music City Classic auction, George established the successful Muscle Car Mayhem vintage muscle car auction in 2002 in Nashville. He also has established a new Louisville Classic Auction at Clark County Auto Auction, located in Jeffersonville, IN and one in Chattanooga, TN. George Eber has also been appraising collector cars since the late 1980’s for such clients as banks and finance companies, insurance companies, auto museums, law firms, the Internal Revenue Service, and the Tennessee Drug Enforcement Agency. George has even been flown to London, England by the English Legal Aid Society to testify as an expert witness in litigation involving collector car fraud. George received a bachelor’s degree in business from the University of Texas in 1971 and an MBA from De Paul University in Chicago in 1974.